LONDON (AP) -- With no allies left to support him, Marius Vizer resigned as president of the umbrella body for international sports federations on Sunday and delivered a defiant rebuke to the critics who forced him out after his attacks on the IOC. 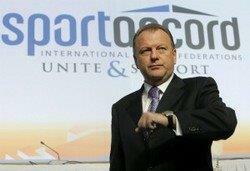 Vizer quit amid a backlash that led more than 20 sports bodies to cut or suspend ties with SportAccord, which represents Olympic and non-Olympic federations. His departure had seemed inevitable ever since he picked a fight with the International Olympic Committee that he was never going to win. Vizer had been left increasingly isolated since blasting the IOC in a speech at the SportAccord convention in Sochi, Russia last month. With Bach looking on, he called the IOC system "expired, outdated, wrong, unfair and not at all transparent" and said Bach's "Olympic Agenda 2020" reform program was of little use to the federations. Last week, Vizer sent Bach a letter with his own 20-point "reform agenda," which included introduction of prize money in the Olympics and a 50 percent share for the federations in the IOC's new Olympic television channel. About two dozen federations have withdrawn or suspended their membership in SportAccord in protest, and Peruvian organizers have pulled out of hosting Vizer's World Combat Games in 2017. Among the bodies that had cut ties with SportAccord were the two associations representing the summer and winter sports in the Olympics. He also lost the support of Sheikh Ahmad Al-Fahad Al-Sabah, the powerful president of the Association of National Olympic Committees.